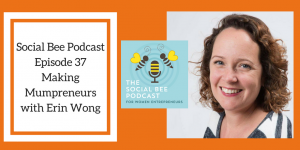 Episode 37 – Erin Wong, Making Mumpreneurs – running multiple businesses and building community online. Erin has been a mumpreneur for over 10 years – from working in corporate television production, after the birth of her first child, Erin started a series of businesses. Inspiring stories about Ealing Mums in Business, moving to the Middle East and starting a membership for mumpreneurs.